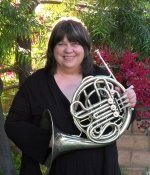 Louise MacGillivray, French hornist, has a BA and MA in Music Performance from CSU Northridge. She is a free-lance musician in Los Angeles and Ventura Counties. In addition to being a member of the music faculty at Cal Lutheran University, she also has a large private teaching studio and is a clinician/adjudicator/consultant for many schools and youth symphonies. Since 1990, she has been the summer horn and chamber music coach for the Idyllwild Arts Symphonic Band and Symphony Orchestra programs. Louise is on faculty of the Colburn Summer Horn Camp. With an extensive background in chamber music, she loves to coach small ensembles.